Martin Pierre Brodeur (French pronunciation: ​[maʁtɛ̃ bʁɔdœʁ]; born May 6, 1972) is a Canadian-American former professional ice hockey goaltender and current team executive. He played 22 seasons in the National Hockey League (NHL), 21 of them for the New Jersey Devils, with whom he won three Stanley Cup championships and five Eastern Conference championships in 17 postseason campaigns. He also won two Olympic gold medals with Team Canada in the 2002 and 2010 Winter Olympic Games, as well as several other medals with Team Canada in other international competitions. Brodeur is widely regarded as one of the greatest goaltenders of all time and in 2017 was named by the league as one of the "100 Greatest NHL Players". He was elected to the Hockey Hall of Fame in 2018. Brodeur holds numerous NHL and franchise records among goaltenders; he ranks as the league's all-time regular season leader in wins (691), losses (397), shutouts (125), games played (1,266), goals scored (2), assists (45), and points earned (47). He won at least 30 games in twelve straight seasons between 1995–96 and 2007–08 and is the only goalie in NHL history with eight 40-win seasons. He is a four-time Vezina Trophy winner, a five-time William M. Jennings Trophy winner, a ten-time NHL All-Star, a Calder Memorial Trophy winner, and one of only two NHL goaltenders to score a goal in both the regular season and the playoffs. Brodeur used a hybrid style of goaltending by standing up more than typical butterfly style goalies, though he adapted to more modern techniques at the latter stage of his career. He was known for his puck handling, his positional play, and his reflexes, especially with his glove hand. Brodeur's prowess at puck handling was so well known that it led in part to the NHL changing its rules regarding where goalies were allowed to handle the puck outside of the goal crease like a sweeper-defenseman, adding what is known as "The Brodeur Rule". He announced his retirement in the middle of the 2014–15 season after a brief stint with the Blues, having played in seven games with the team. He is the current executive vice president of business development for the Devils. Martin Brodeur was born on May 6, 1972, in Montreal. He was one of five children of Denis and Mireille Brodeur. Denis played in the 1956 Olympics for Team Canada and won a bronze medal. After his playing career, Denis was a longtime photographer for the Montreal Canadiens. For more than 20 years, he attended all Montreal games and practices, and when Martin was old enough, he came along. Brodeur idolized Canadiens goaltender Patrick Roy. The next season my coach came up to me and said, 'Do you want to be a goalie or forward this year?' It was the biggest decision of my life, and I was seven years old. I don't know why I decided, but I thought it would be fun to play goal. When he was 12 years old, Brodeur briefly intended to stop playing hockey, after he had been removed from his team's lineup for not showing up at a game. Following a conversation with his brother Claude, though, he decided to continue playing. When receiving goaltending instructions in his teens, Brodeur was taught a variety of different styles, ranging from butterfly to stand-up, and paid attention to the technique of others playing the position. He attended a camp run by retired Soviet goalie Vladislav Tretiak, who encouraged the use of multiple methods; Brodeur believes that the concept made him "a student of the game." In the 1989–90 season, he made it to the Quebec Major Junior League. While playing with the Saint-Hyacinthe Laser, Brodeur made the QMJHL All-Rookie team in 1989–90 and the QMJHL 2nd All-Star Team in 1991–92. Brodeur was drafted by the New Jersey Devils in the first round (20th overall) in the 1990 NHL Entry Draft. In the 1991–92 NHL season, Brodeur spent most of his time with Saint-Hyacinthe in the QMJHL, but was called up to the NHL on an emergency basis for four games when New Jersey goaltenders Chris Terreri and Craig Billington became injured. Brodeur won his NHL debut against the Boston Bruins, 4–2, and played in one playoff game that season. Brodeur spent the following season with the Utica Devils of the American Hockey League (AHL). However, in the 1993–94 season, Brodeur returned to the NHL permanently and gained recognition when he won the Calder Trophy, an annual award for the best rookie in the NHL. He led the Devils to the second-best record in the league and the Eastern Conference Finals in the playoffs, where they lost to the New York Rangers in seven games. He finished 2nd in goals against average (GAA) (2.40) and 4th in save percentage (.915) in 47 games played during the regular season, helping him eventually land the starting job over Terreri. In the last game against Detroit, the time from ten minutes left to one minute left was probably the longest nine minutes of my life. But from one to zero was probably the greatest time I've ever had. I didn't want the clock to run out. It was such a great feeling: people crying in the stands, people jumping up and down, people cheering. Guys couldn't even sit up on the bench. It was probably the best minute of my life. 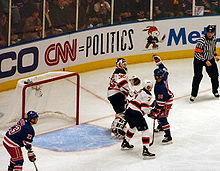 After a year of success, the Devils were in the middle of the pack for most of the 1995–96 season and barely missed the playoffs. Brodeur played in 74 of his team's 82 games, setting a single-season record for most minutes played by a goalie, while having the 2nd-most shutouts (6) in the league. He was named the starter in the All-Star Game for the Eastern Conference and stopped all 12 shots he faced. He finished fourth in voting for the Vezina Trophy, which is awarded to the league's top goaltender. Brodeur also played on Team Canada during the 1996 World Cup of Hockey, where Canada lost to the United States in the gold medal finals. In the 1996–97 season, the Devils finished 3rd in the NHL. Brodeur was runner-up for the Vezina Trophy, was named to the All-Star team, and had the lowest goals against average by a goalie in almost 30 years, earning him the Jennings Trophy. He also had 10 shutouts and a .927 save percentage. On April 17, 1997, in the first game of a first-round playoff matchup against the Montreal Canadiens, Brodeur fired the puck the length of the ice and into the Canadiens' empty net to ensure a 5–2 victory. It was only the second time in NHL history that a goaltender had scored in the playoffs, and the fifth time overall. The Devils went on to win that series, but lost in the second round to the rival New York Rangers. The following year, Brodeur had 43 wins and 10 shutouts in the regular season. The Devils finished first in the Eastern Conference, but lost in the first round of the playoffs to the eighth-seeded Ottawa Senators. Once again, Brodeur made the All-Star Team, finished as a runner-up for the Vezina Trophy, and won the Jennings Trophy. In the 1998–99 season, the Devils finished first in the Eastern Conference for the third straight year, with Brodeur winning 39 games. He was among the contenders for the Vezina Trophy and started in the All-Star game, making his fourth appearance. However, the Devils lost in the first round to the Penguins. It was Brodeur's worst playoff performance to date statistically, as he allowed 20 goals in seven games with an .856 save percentage. During the 1999–2000 season, on February 15, 2000, Brodeur was credited with his second career goal, as Brodeur was the last Devils player on the ice to touch the puck before Daymond Langkow of the Flyers accidentally put the puck into his own empty net during a delayed penalty call against the Devils. Brodeur had previously stopped an attempted Flyers shot. That season, Brodeur won 43 games for the second time in his career, and the Devils finished with the fourth spot in the Eastern Conference after losing the division to the Flyers by two points. Brodeur helped the Devils sweep the Florida Panthers in the first round, giving up only six goals in four games. In the next round against the Toronto Maple Leafs he recorded two shutouts, including one in the final game of the series as the Devils went on to win four games to two, setting up a showdown with rival Philadelphia in the Eastern Conference Finals. The Flyers took a 3–1 series lead and had home ice to close out the series, but Brodeur gave up only one goal in each of the remaining three games of the series, propelling the Devils to a comeback series victory in 7 games. They went on to play the Dallas Stars in the Stanley Cup Final, who had a higher seed but fewer regular season points, giving the Devils home ice advantage in the series. After taking game one with a 7-goal rally against Dallas, the Devils were led by Brodeur the rest of the way as he gave up only six goals in the next five games, giving the team their second Stanley Cup Championship in six years. The next year, Brodeur topped the 40-win mark for the third time in his career, despite having an average GAA and save-percentage throughout the season. He played in the All-Star Game for the 6th consecutive season, and helped the Devils earn the top seed in the Eastern Conference. In the first round Brodeur recorded two shutouts against the Carolina Hurricanes and the Devils took the series in six games. After struggling to beat 7th-seeded Toronto in seven games, the Devils defeated the 6th-seeded Penguins in the Eastern Conference Finals, where Brodeur added two more shutouts, both on the road. In their second straight Stanley Cup finals appearance, the Devils played a back-and-forth series against the top seeded Colorado Avalanche, and lost in seven games. In the 2001–02 season, Brodeur finished among the league leaders in wins and GAA. Brodeur continued to lead the league in victories and remained a Vezina and MVP candidate. The next season, in 2002–03, Brodeur won the Vezina Trophy for the first time. He also won the Jennings Trophy again, was a Hart Memorial Trophy finalist for the league's Most Valuable Player, and was named a 1st Team All-Star and started in the All-Star Game. With one of the most impressive playoff performances of his career, Brodeur guided the Devils to their third Stanley Cup victory after seven-game series wins against the top-seeded Ottawa Senators and the 7th-seeded Mighty Ducks of Anaheim. He posted 3 shutouts against Anaheim and had a playoff total of 7 overall, breaking the NHL record of 6 that had been set by Dominik Hašek the previous year. Despite this, the Conn Smythe Trophy for playoff MVP was awarded to Anaheim goaltender Jean-Sébastien Giguère, who became the first player not on the championship team to be named playoff MVP since Ron Hextall of Philadelphia in 1987. Some hockey writers speculated a New Jersey player did not win because there were multiple candidates, resulting in a split vote among the sportswriters who selected the winner. In the 2003–04 season, Brodeur won his second consecutive Vezina Trophy and Jennings Trophy. He was a first Team All-Star, a starter in the NHL All-Star Game, and a finalist for the Hart Trophy again. The Devils lost the Atlantic Division title by 1 point to the Philadelphia Flyers, who thus obtained the third seed and home ice advantage against the sixth-seeded Devils in the first round of the playoffs. This would be too much for Brodeur and the Devils to overcome, as the Flyers went on to defeat them in five games. The goaltender trapezoids behind each goal, added by the NHL before the 2005–06 season, were widely viewed as singling out Brodeur for his puck-handling skills. After the 2004–05 lockout and before the start of the 2005–06 season, the league instituted a new rule preventing goaltenders from playing the puck behind the goal line, except within a trapezoid-shaped zone located behind the net. The trapezoid began at the goal line with angled lines six feet from each goal post and widened to 28 feet at the end boards. Former Flyers general manager Bobby Clarke was one of the leaders in getting the trapezoid implemented. This was viewed by many as singling out Brodeur, who was one of the best at getting behind the net to handle the puck, and has come to be known as the "Brodeur Rule". At the 2009 NHL General Managers' Meeting, it was discussed whether the rule should be eliminated as a solution to the increasing number of injuries on defenseman who were being hit hard by forechecking forwards. The forecheckers were no longer impeded by defencemen holding them up because of the crackdown on interference, which created situations where defencemen were being hit at high speeds. Brodeur believed that revoking the trapezoid could result in more scoring and more exciting games. He explained, "If you give the liberty to the goalies to play the puck, they'll mess up more than they're successful." He also expressed his concern for defencemen, "It's a no-brainer if they want to start to eliminate these huge hits for the defencemen ... Whenever my defencemen or somebody was getting a big hit, I felt guilty that I let that guy get hit like that. Now, I've got to sit and watch all the time ... You've got to try to find something because so many guys are getting hurt." At the time of his statement, Devils defencemen Paul Martin, Johnny Oduya and Bryce Salvador were all out with injuries. Ultimately the suggestion was rejected and the rule stayed in place. Former Maple Leafs' general manager Brian Burke said, "We had originally approved a rule where the goaltenders couldn't handle the puck behind the net at all. The game was turning into a tennis match. You'd dump it in and the goalie would throw it out and now with the soft chip into the corner it turns into a puck battle and a forecheck opportunity, which is what we wanted." After the 2004–05 NHL lockout canceled the 2004–05 season, Brodeur signed a contract extension with the Devils on January 27, 2006, that would pay him $31.2 million over six years. In the 2005–06 season he posted 43 wins, adding onto his NHL records of what were now five 40-win seasons and ten consecutive 30-win seasons. After struggling early in the season, his improved play later on made him a finalist for the Vezina Trophy for the third straight year, and helped lead the Devils to a surprising comeback in the last two months of the season that resulted in them winning the Atlantic Division in the final game of the year. In the first round of the playoffs, he won a postseason series against the Rangers for the first time in his career, leading the Devils to a four-game sweep. But a 4–1 series loss to the Carolina Hurricanes eliminated the Devils in the next round. In the 2006–07 season, Brodeur made his ninth NHL All-Star Game appearance in Dallas, Texas, won his third Vezina Trophy and rose on several NHL records lists. On December 8, 2006, he posted a 2–0 victory over the Philadelphia Flyers for his 462nd career win, moving him into 2nd place on the all-time list ahead of Ed Belfour. Just a few weeks later, on December 26, Brodeur beat the Pittsburgh Penguins 3–0 to record his 85th career shutout, moving him past Glenn Hall for 3rd place on that all-time list and 1st place among all active goalies. On February 1, 2007, Brodeur beat the Philadelphia Flyers 6–5 in overtime to take the all-time lead in overtime (non-shootout) wins with 45, passing Roy. The Devils' first 38 wins of the season were all with Brodeur in net, leading him to set a NHL record for most consecutive wins for a team. Brodeur readies himself for action during a game in 2008. On April 3, 2007, Brodeur tied the NHL record for most wins in a single season with 47, set by Bernie Parent in 1973–74, in a 2–1 shootout victory against the Ottawa Senators. Two days later, he broke the record with his 48th win in a 3–2 victory over the Philadelphia Flyers, which helped the Devils clinch the Atlantic Division title. In the Eastern Conference Quarterfinals against the Tampa Bay Lightning, Brodeur started out shaky and the Devils fell behind two games to one. He rebounded, however, to finish the series, and helped the team advance in six games, while passing Grant Fuhr for second place in all-time playoff victories. In the second round against the Ottawa Senators, the Devils were defeated in five games as the Senators scored 15 goals during the series. In the 2007–08 season, Brodeur became the second goalie in NHL history to reach 500 wins with a victory against the Flyers on November 17, 2007. The only other goalie to achieve the feat is Roy. Brodeur was also named the starting goalie for the Eastern Conference in the 2007–08 NHL All Star Game in Atlanta. However, he was unable to participate because of a family obligation. Sean Avery attempts to distract Brodeur during game 3 of the first round of the 2008 Stanley Cup Playoffs. After losing a bitter series against the rival Rangers in the opening round of the 2008 NHL playoffs, Brodeur refused to shake Sean Avery's hand. During game three of the series, in an unusual move, Avery turned to face Brodeur during a 5-on-3 power play, and began waving his hands and stick in front of Brodeur's face in an effort to distract him. The day after this game the NHL announced that it had revised its unsportsmanlike conduct rule, now known as The Sean Avery Rule, effectively outlawing such antics. Brodeur started wearing a new painted mask design for the 2008–09 NHL season with a stylized "MB30" on the front, replacing the "J" that had been on his mask for nearly his entire NHL career. During a game on November 1, 2008, Brodeur suffered a "bruised elbow" which would later be diagnosed as a torn distal biceps tendon, the first major injury in his career. Following surgery on November 6, he would miss 16 weeks of the season before playing his next game on February 26, 2009. Upon returning from the injury, Brodeur registered a 4–0 shutout against the Colorado Avalanche for his 99th career shutout. Three days later, he recorded his 100th career shutout against the Philadelphia Flyers, three short of Terry Sawchuk's NHL record. Beginning in 2009, Brodeur broke a number of career records for goaltenders. He missed 50 games in the 2008–09 season, but a winning streak upon his return pushed him near the NHL's all-time win record. On March 14, 2009, the Devils defeated the Canadiens 3–1 to give him the 551st win of his career, tying him with Roy for the NHL record. Three days later, Brodeur surpassed Roy with a 3–2 win over the Chicago Blackhawks in New Jersey. Brodeur topped another of Roy's previous marks on November 27, as he set the record for the most minutes played in the NHL, which had been 60,235. His 1,030th career appearance, which happened on December 18, broke Roy's record of 1,029. He also set the mark for the most regular-season shutouts with a 4–0 win against the Penguins on December 21, breaking Sawchuk's record of 103. On December 30, 2009, Brodeur and the Devils shut out the Penguins, 2–0. It was his 105th career shutout, giving him the all-time professional record, surpassing George Hainsworth's total of 104 combined in the NHL (94) and Western Canada Hockey League (10). On April 6, 2010, Brodeur reached his 600th career win by defeating the Thrashers 3–0. This was also his 110th career shutout. In the 2009–10 NHL season, Brodeur led the NHL in wins (45), shutouts (9), games played (77) and minutes played (4,499). He also won his fifth Jennings Trophy and had the third-best GAA in the league, leading his team to back-to-back division wins that included a 6–0 regular-season sweep of the defending Stanley Cup champion Penguins. However, the Devils lost in the first round of the playoffs, losing to the seventh-seeded Flyers in five games. Brodeur had a 5–18–1 stretch to begin the 2010–11 season, as New Jersey slumped to the bottom of the NHL. Although the Devils improved in the second half of the season, they did not reach the playoffs; Brodeur recorded 23 wins and a 2.45 GAA, but had his lowest save percentage (.903) in 16 seasons. The Devils returned to the playoffs in the 2011–12 NHL season, as Brodeur recorded his 14th 30-win season. In Game 1 of the conference quarterfinals against the Panthers, Brodeur became only the second goaltender to record 100 playoff wins in a 3–2 Devils victory. In Game 4 with a 4–0 victory, Brodeur broke the NHL career playoff shutout record with his 24th, surpassing Roy, who had 23. The Devils advanced by winning Game 7 in double overtime, after Brodeur had made 43 saves to keep his team in the contest. Following a second round series win over the Flyers, Brodeur and the Devils defeated the Rangers four games to two in the Eastern Conference finals. New Jersey won the sixth game 3–2 on an overtime goal by Adam Henrique, leading to Brodeur's fifth Stanley Cup Finals appearance. The Devils lost in the Finals to the Los Angeles Kings in six games. Brodeur was 14–10 in the postseason with a save percentage of .917, after winning 16 playoff games in the previous eight years. During the off-season of 2012, Brodeur hired agent Pat Brisson, leading many analysts to believe he would test free-agency or retire. However, on July 2, 2012, Brodeur agreed to a two-year, $9 million deal to remain with the Devils, alongside backup goalie Johan Hedberg. On March 21, 2013, in his first game back from a month-long absence due to a pinched nerve injury in his upper back, Brodeur was credited with a power play goal against the Carolina Hurricanes, making him the only NHL goalie to record three career goals, and the first goalie to score on the power play since Evgeni Nabokov in 2002. Brodeur had a 13–9–7 record in his 29 appearance in 2012–13, with a 2.22 GAA. The following season, he shared the Devils' starting goalie position with Cory Schneider, whose 45 games played were six more than Brodeur's total. Brodeur's statistical performance declined, as his GAA increased to 2.51, more than half a goal higher than Schneider. In 39 games played, Brodeur had a .901 save percentage, lower than the league average. Among his 19 wins in 2013–14 was a victory in the season finale against Boston, his 688th for New Jersey. On June 6, 2014, Brodeur told ESPN he would test the free agency market for the 2014–15 season, and his 21-year tenure with the Devils ended. On November 26, 2014 Brodeur signed a tryout contract with the St. Louis Blues after their starting netminder, Brian Elliott, was injured. A week later, on December 2, Brodeur signed a one-year, $700,000 deal with the Blues. On January 27, 2015, it was reported that Brodeur had decided to retire from the NHL. The decision followed Elliott's return to the Blues, as Brodeur had been demoted to the team's number-three goalie behind Elliott and Jake Allen. Brodeur announced the news at a press conference two days later. He retired having started just five games with the Blues, going 3–3–0 in seven appearances. His final NHL win was a 3–0 shutout against the Avalanche on December 29, 2014. Upon announcing his retirement, Brodeur was hired by the Blues as a special assistant to general manager Doug Armstrong. On May 22, 2015, Armstrong announced that Brodeur and the Blues had agreed to a three-year contract naming Brodeur as an assistant general manager of the team. On February 8, 2016, the New Jersey Devils unveiled a bronze statue of Brodeur which is displayed outside the Prudential Center. The statue was formally dedicated on October 22, 2016, in a ceremony before the game against the Minnesota Wild. On February 9, 2016, Brodeur's number 30 jersey was retired by the Devils. On July 25, 2017, Brodeur was appointed a management team member for Canada's men's team for the 2018 Winter Olympics in Pyeongchang, Korea. On August 29, 2018, Brodeur joined the Devils as executive vice president of business development. Brodeur was selected as Team Canada's back-up goalie to Roy for the 1998 Winter Olympics in Nagano, Japan, but did not get to play. Canada failed to win a medal after losing the bronze-medal match to Finland, a game in which many people thought Brodeur should have played. In the 2002 Olympics at Salt Lake City, Utah, Brodeur was initially named the backup behind Curtis Joseph. But following Joseph's losing the tournament opener against Sweden, Brodeur was named the starting goaltender the rest of the way, and won gold for Canada. He went undefeated in the tournament, stopping 31 of 33 shots in the gold-medal victory over Team USA. Brodeur is arguably the top goaltender in the world. Fresh off a World Cup win in 2004 and another strong performance at the 2005 IIHF World hockey championships. He's the game's best puck-handling goaltender, though the NHL's new rules changes may somewhat alter that effectiveness. Brodeur was selected as Team Canada's starter in the 2006 Winter Olympics in Turin, Italy. He started in 4 games, but Canada failed to win a medal after losing to Russia in the quarterfinals. He was one of the three goalies on Team Canada for the 2010 Winter Olympics in Vancouver, British Columbia, Canada. He registered a shootout win against Switzerland and a loss to the United States. After the loss to the US, he was benched for the remainder of the 2010 Games in favour of Roberto Luongo. Brodeur married Melanie Dubois (a native of Saint-Liboire, Quebec) in August 1995 with whom he has four children: Anthony, born in 1995; twin sons, William and Jeremy, born in 1996; and Anabelle Antoinette, 2002. Melanie filed for divorce during the 2003 playoffs amid reports that Brodeur was having an affair with Genevieve Nault, the wife of Melanie's brother. The incident was referred to by opposing fans during the playoffs. The reports proved to be true, as he and Genevieve married in June 2008. Their first child together, Maxime Philippe Brodeur, was born in November 2009. Brodeur is regarded as an engaging raconteur in his spare time. He has hosted a street hockey tournament in his hometown of St. Leonard, Quebec, for each of the Devils' Stanley Cup championships, where he played as a forward. His oldest brother, Denis Jr., is a photographer like their father, and his other older brother, Claude, was a minor league baseball pitcher in the Montreal Expos' organization. He has two sisters, Line and Sylvie. In 2005, Brodeur began co-authoring his autobiography, Brodeur: Beyond the Crease, with long-time Toronto Star columnist and ESPN contributor Damien Cox, which was released in October 2006. Some of the things Brodeur talks about in the book are player salaries and contracts, NHL marketing, Lou Lamoriello, and the Devils' new arena in Newark, the Prudential Center. Brodeur also includes his views on the "new NHL" after the lockout, and how it affected his career. Brodeur co-owns a business called La Pizzeria Etc. with former teammate Sheldon Souray. The idea came about after Souray was traded to play in Montreal, the city in which the business now operates. Brodeur was a resident of North Caldwell, New Jersey, and currently resides in West Orange, New Jersey, near the Devils' former practice facility, South Mountain Arena. He became a naturalized United States citizen on December 1, 2009, but per IIHF rules would only be able to compete for Canada. On June 30, 2013, the Devils traded for the 208th pick in the 2013 NHL Entry Draft and Brodeur was asked to make the announcement to select his son, Anthony. In August 2015, Anthony signed with the Penticton Vees of the British Columbia Hockey League. Fans picked Brodeur to appear on the cover of the video game NHL 14, choosing him in a series of votes that included 60 players. He was the first goalie in 17 years to have his image on the cover. During his NHL career, Brodeur set numerous league records. He ended his career with 691 wins, 140 more than Roy, who is second on the NHL's all-time list. Brodeur extended his record shutout total to 125, 22 more than second-place Sawchuk. After his final season, he had played in 1,266 regular season games, a total more than 200 above that of any other goalie. In nine seasons, Brodeur was the NHL wins leader, and in five other seasons he was among the top five goalies in the category. Brodeur's honors include three Vezina Trophy wins as the top goalie in the NHL, and the 1993–94 Calder Trophy as rookie of the year. His total of five Jennings Trophies is tied for the most in NHL history, matching Roy's record. In postseason play, he had the most shutouts of any NHL goalie (24), and his 113 playoff wins ranks second all-time. Sportswriters and players have called Brodeur one of the greatest goalies in NHL history. USA Today's Kevin Allen placed Brodeur in a group including Roy and Sawchuk as the leading NHL goalie, noting that Brodeur had the advantage in wins. Writer Steve Politi noted Brodeur's longevity as an advantage on other top all-time goalies such as Roy; Brodeur played 70 or more games in 12 seasons, compared to 0 for Roy. Sportsnet's Chris Boyle, after running a statistical analysis, placed Brodeur eighth in his all-time goaltending list; he offered the rationale that Brodeur's teammates helped him achieve his major records, while goalies such as Roy and Hašek had superior stats in their best seasons. Adam Laskaris has considered Brodeur overrated, since his category-leading wins and shutouts were largely attributed to playing behind Devils teams whose strong defense limited the shots he faced compared to other goalie of his era, Brodeur also had a mediocre save percentage for much of his career; among Brodeur's contemporaries Laskaris has considered Hašek and Roy to be superior, in the regular season and playoffs, respectively. Brodeur is remembered for his playing style: writer Katie Strang called him "one of the most innovative [goalies] ever to play the game", due to his "superior puck-handling skills". Scott Gomez, a former teammate of Brodeur in New Jersey, considered his goalie to be the equivalent of an extra defenceman. A rule disallowing goalies from handling the puck outside a trapezoid shaped area behind the net is called "The Brodeur Rule" by some who believe his tendency to play the puck in the corners inspired the rule. His playing style proved uncommon among goalies of his era, as most of his competitors used a butterfly style exclusively. On June 26, 2018, it was announced that Brodeur would be inducted into the Hockey Hall of Fame. †Shared with Mike Dunham in 1997. Tied with Roman Čechmánek and Robert Esche in 2003. ^ a b Dan Rosen (December 2, 2009). "Brodeur now U.S. citizen, but remains loyal to Canada". NHL.com. Retrieved October 20, 2016. ^ Rosen, Dan (March 18, 2009). "Is Brodeur setting the bar beyond reach?". NHL.com. Retrieved March 19, 2009. ^ Morreale, Mike G. (March 23, 2010). "Brodeur reaches 40 wins again as Devils rip Jackets". NHL.com. Retrieved March 24, 2010. ^ "Martin Brodeur, Devils – Notes". NHL.com. Retrieved March 19, 2009. ^ a b c d "Martin Brodeur Biography". hockeygoalies.org. Retrieved December 31, 2006. ^ Saed Hindash. "Devils' goalie Martin Brodeur tweaks leg pads and has won 4 of his last 5 starts". The Star-Ledger. Retrieved November 24, 2012. ^ a b Cox, Damien (March 18, 2009). "Brodeur the best? There's no debate". ESPN.com. Retrieved March 18, 2009. ^ a b Woodley, Kevin (January 29, 2015). "Unmasked: Old-school style helped Brodeur stand out". National Hockey League. Retrieved October 14, 2016. ^ a b Diamos, Jason. (September 16, 2005). "New Rule Will Take a Weapon Away from Brodeur". The New York Times. Retrieved March 2, 2007. ^ a b "Martin Brodeur – Career statistics". NHL.com. 2007. Retrieved March 3, 2007. ^ Zeisler, Laurel (2012). Historical Dictionary of Ice Hockey. Scarecrow Press. pp. 48–49. ISBN 9780810878631. ^ Brodeur, Martin; Cox, Damien (2007). Brodeur: Beyond the Crease. John Wiley & Sons Canada. pp. 139–140, 143. ISBN 978-0-470-15377-2. ^ Allen, Kevin (January 29, 2006). "Brodeur following in father's mask". USA Today. Archived from the original on September 11, 2006. Retrieved December 1, 2006. ^ a b c d "Stanley Cup Journal". HHOF.com. Hockey Hall of Fame. August 22, 2003. Archived from the original on June 4, 2011. Retrieved December 1, 2006. ^ "Martin Brodeur – Facts about ..." MartinBrodeur.net. Wayback Machine. 2007. Archived from the original on February 17, 2007. Retrieved April 6, 2007. ^ a b c d Allen, Kevin (January 27, 2015). "Martin Brodeur retiring with Blues, will always be Devil". USA Today. Retrieved October 31, 2016. ^ Brodeur and Cox, pp. 56–58. ^ a b c d e "NHL Player Search: Martin Pierre Brodeur". Hockey Hall of Fame. Retrieved September 28, 2016. ^ Rosen, Dan (March 12, 2009). "Brodeur was a scorer before he was a goalie". NHL.com. Retrieved March 17, 2009. ^ "1994 National Hockey League Playoffs". nbpfaus.net. 2001. Retrieved February 9, 2007. ^ a b c d e f g h i j k l m n o p q "Martin Brodeur". Hockey-Reference. Archived from the original on June 18, 2014. Retrieved September 30, 2016. ^ Elliott, Josh (February 1, 2015). "Top Five Unsung Backup Goalies To Martin Brodeur". The Hockey News. Retrieved September 30, 2016. ^ a b Pickens, Pat (September 16, 2014). "1994–95 champion Devils: An oral history, Pt. 2". Sportsnet. Retrieved September 30, 2016. ^ "1994–95 NHL Summary". Hockey-Reference. Retrieved September 30, 2016. ^ Pickens, Pat (September 17, 2014). "1994–95 champion Devils: An oral history, Pt. 3". Sportsnet. Retrieved September 30, 2016. ^ "New Jersey Devils playoff history". Yahoo! Sports. April 28, 2009. Retrieved September 30, 2016. ^ Pickens, Pat (September 18, 2014). "1994–95 champion Devils: An oral history, Pt. 4". Sportsnet. Retrieved September 30, 2016. ^ Pickens, Pat (September 19, 2014). "1994–95 champion Devils: An oral history, Pt. 5". Sportsnet. Retrieved September 30, 2016. ^ LeBrun, Pierre (June 9, 2016). "Penguins goalie Matt Murray has played more like a Hall of Famer than a rookie". ESPN. Retrieved September 30, 2016. ^ "1995–96 NHL Awards Voting". Hockey-Reference. Retrieved October 3, 2016. ^ "Vezina Trophy winners". ESPN. June 24, 2015. Retrieved October 3, 2016. ^ Burnside, Scott (September 15, 2015). "Five greatest teams in World Cup/Canada Cup history". ESPN. Retrieved October 3, 2016. ^ "Martin Brodeur – Facts". MartinBrodeur.net. Archived from the original on February 17, 2007. Retrieved December 31, 2006. ^ "1997 NHL Stanley Cup Playoffs Summary". Hockey-Reference. Retrieved October 3, 2016. ^ Ng, Rob (January 26, 2014). "With outdoor game at Yankee Stadium, Devils–Rangers rivalry enters new chapter". New York Daily News. Retrieved October 3, 2016. ^ "1997–98 NHL Standings". hockeydb.com. 1998. Retrieved March 3, 2007. ^ "1997–98 NHL Playoff Results". hockeydb.com. 1998. Retrieved March 3, 2007. ^ "1998 NHL Awards". hockeynut.com. 1998. Retrieved March 3, 2007. ^ Bostrom, Don. (February 11, 2007). "Devils' Brodeur is closing in on becoming NHL's new zero hero". mcall.com. Retrieved October 14, 2016. ^ Hofmann, Rich (February 16, 2000). "A Game-winner Never Brodeur's Goal". Philadelphia Daily News. Retrieved October 5, 2016. ^ "1999-00 NHL Standings". hockeydb.com. 2000. Retrieved March 20, 2007. ^ "1999-00 NHL Playoffs". hockeydb.com. June 10, 2000. Retrieved March 20, 2007. ^ "Game 6 recap". CNN SI. June 8, 2001. Archived from the original on December 17, 2003. Retrieved March 20, 2007. ^ Associated Press (June 10, 2001). "Devils fall one game short in repeat quest". CNN SI. Archived from the original on June 27, 2001. Retrieved March 20, 2007. ^ "Raising the Cup presents: Game 7 2001 Stanley Cup Final". National Hockey League. August 12, 2011. Retrieved October 5, 2016. ^ "Vezina Trophy Winner: Brodeur, Martin". Hockey Hall of Fame. Retrieved August 19, 2012. ^ "NHL Scoreboard – June 9, 2003: Anaheim Ducks at New Jersey Devils (recap)". ESPN Internet Ventures. June 9, 2003. Retrieved April 17, 2007. ^ Associated Press (2003). "2003 NHL playoffs – Statitudes". CNN SI. Archived from the original on December 29, 2003. Retrieved April 12, 2007. ^ "Conn Smythe Trophy". NHL.com. Retrieved October 14, 2016. ^ "Who will win the Conn Smythe?". CBC Sports. June 6, 2003. Retrieved November 28, 2006. ^ Beaton, Rod (June 9, 2003). "Trophy, stats no consolation for Giguere". USA Today. Retrieved November 28, 2006. ^ Beaton, Rod (February 8, 2004). "Messier sets All-Star game assist record in East's 6–4 win". USA Today. Retrieved October 5, 2016. ^ "2003–04 NHL Awards Voting". Hockey-Reference. Retrieved October 5, 2016. ^ "2003–04 NHL Summary". Hockey-Reference. Retrieved October 5, 2016. ^ "National Hockey League Official Rules 2005–06" (PDF). National Hockey League. 2005. p. 64. Archived from the original (PDF) on March 13, 2007. Retrieved October 14, 2016. ^ Gulitti, Tom (November 10, 2009). "Brodeur hopes NHL banishes trapezoid". Fire&Ice. Archived from the original on November 13, 2009. Retrieved November 10, 2009. ^ Associated Press (March 4, 2006). "Brodeur sets goaltending mark in Devils win". TSN. Archived from the original on March 10, 2007. Retrieved December 6, 2006. ^ "NHL Announces 2005–06 Trophy Finalists". Florida Panthers. May 4, 2006. Retrieved May 17, 2013. ^ "Devils complete comeback to capture Atlantic Division title". MSG Network. 2006. Archived from the original on September 28, 2007. Retrieved March 5, 2007. ^ DeLessio, Joe (May 14, 2012). "Rangers vs. Devils: A Postseason History". New York. Retrieved October 17, 2016. ^ "2006 NHL Stanley Cup Playoffs Summary". Hockey-Reference. Retrieved October 17, 2016. ^ "Devils 2, Flyers 0". New Jersey Devils. Associated Press. 2006. Archived from the original on May 28, 2013. Retrieved October 5, 2012. ^ "Penguins Devils Recap – Tuesday December 26, 2006". Yahoo Sports!. 2006. Retrieved December 26, 2006. ^ Weekes, Don (2007). Crease-Crashing Hockey Trivia. Greystone Books. p. 49. ISBN 9781926685113. ^ "Devils goalie Clemmensen gets first win in 11 months". ESPN. 2007. Retrieved April 12, 2007. ^ "2006–07 NHL Standings". Yahoo! Sports. 2007. Retrieved April 4, 2007. ^ Gelston, Dan (April 5, 2007). "Brodeur Breaks NHL Mark With 48th Win". The Washington Post. Associated Press. Retrieved October 17, 2016. ^ a b Goodall, Fred (April 23, 2007). "Martin Brodeur, Devils oust Lightning". USA Today. Associated Press. Retrieved October 17, 2016. ^ "2007 NHL Stanley Cup Playoffs Summary". Hockey-Reference. Retrieved October 17, 2016. ^ "Devils' Brodeur joins Roy as member of 500-win club". USA Today. Associated Press. November 19, 2007. Retrieved October 17, 2016. ^ Gulitti, Tom (January 22, 2008). "Brodeur pulls out of all-star game". Fire&Ice. Retrieved October 17, 2016. ^ "NHL reacts quickly to Avery's antics, amends unsportsmanlike conduct rule". NHL.com. Associated Press. April 14, 2008. Retrieved August 10, 2012. ^ Marin, Eric (October 8, 2008). "Brodeur debuts new mask at practice". National Hockey League. Retrieved October 17, 2016. ^ Associated Press (February 26, 2009). "Marty's back, as good as ever". NHL.com. Retrieved February 26, 2009. ^ "Brodeur records 100th shutout as Devils widen gap on Flyers". USA Today. Associated Press. March 2, 2009. Retrieved October 17, 2016. ^ a b "Martin Brodeur becomes all-time winningest NHL goalie". USA Today. March 17, 2009. Retrieved October 7, 2009. ^ Rosen, Dan (March 15, 2009). "Roy glad to be there for Brodeur's big night". NHL.com. Retrieved March 19, 2009. ^ "Brodeur sets minutes mark as Devils beat Bruins". New York Daily News. Associated Press. November 27, 2009. Retrieved October 7, 2016. ^ "Devils goalie Brodeur plays in 1,030th game, breaks Patrick Roy's NHL record". NHL.com. Canadian Press. December 18, 2009. Retrieved October 7, 2016. ^ "Devils' Brodeur is NHL shutout King". National Hockey League. December 21, 2009. Retrieved October 7, 2016. ^ Stephenson, Colin (December 31, 2009). "Martin Brodeur's 32 saves lead NJ Devils to a 2–0 victory over the Pittsburgh Penguins". The Star-Ledger. Retrieved October 24, 2016. ^ Zweig, Eric (December 23, 2009). "Brodeur Still Needs One More Shutout To Become The 'Major League' King". The Hockey News. Retrieved October 24, 2016. ^ "Martin Brodeur grabs 600th career win, New Jersey Devils blank Thrashers, 3–0". New York Daily News. Associated Press. April 6, 2010. Retrieved October 24, 2016. ^ Mazzeo, Mike (May 29, 2012). "Martin Brodeur thinking return". ESPN. Retrieved October 12, 2016. ^ "Devils' Martin Brodeur has sprained right knee". USA Today. Associated Press. February 8, 2011. Retrieved October 12, 2016. ^ a b Morreale, Mike (August 31, 2011). "DeBoer's task: Get Devils back into playoffs". New Jersey Devils. Retrieved October 12, 2016. ^ "NHL: Martin Brodeur's record-setting 24th playoff shutout helps New Jersey Devils tie series with Florida Panthers". San Jose Mercury News. Associated Press. April 19, 2012. Retrieved October 7, 2016. ^ a b c Rosen, Dan (February 8, 2016). "Brodeur enjoyed last hurrah in 2012 Final". National Hockey League. Retrieved October 19, 2016. ^ Proteau, Adam (May 25, 2012). "Brodeur Shows Lundqvist How To Win In Playoffs". The Hockey News. Retrieved October 19, 2016. ^ Rosen, Dan (July 2, 2012). "Brodeur and Hedberg staying with Devils". NHL.com. Retrieved July 3, 2012. ^ a b "Devils goalie Martin Brodeur scores 3rd career goal in win". ESPN. Associated Press. March 21, 2013. Retrieved October 24, 2016. ^ McIndoe, Sean (October 23, 2013). "Great Moments in Goalie Goal-Scoring History". Grantland. Retrieved October 24, 2016. ^ a b Rosen, Dan (April 13, 2014). "Devils' Brodeur exits to cheers, unsure of future". National Hockey League. Retrieved November 2, 2016. ^ a b Peters, Chris (June 6, 2014). "Martin Brodeur says he'll test free agency this offseason". CBS Sports. Retrieved October 24, 2016. ^ "Retired Martin Brodeur: 'My Hockey Career Is All About The Devils'". WCBS-TV. Associated Press. January 29, 2015. Retrieved October 24, 2016. ^ Louie Korac (November 26, 2014). "Blues' Elliott week-to-week; Brodeur in as tryout". NHL.com. Retrieved November 26, 2014. ^ Louie Korac (December 2, 2014). "Brodeur signs one-year contract with Blues". NHL.com. Retrieved December 2, 2014. ^ a b c "Martin Brodeur retires, joins Blues management". Toronto Star. Canadian Press. January 29, 2015. Retrieved October 21, 2016. ^ Strang, Katie (May 22, 2015). "Blues name Martin Brodeur assistant GM". ESPN. Retrieved May 22, 2015. ^ "Martin Brodeur statue unveiled: Devils great gets emotional seeing himself in bronze". NJ.com. February 8, 2016. Retrieved May 31, 2016. ^ Mazzeo, Mike (February 10, 2016). "Martin Brodeur: Fan response to jersey retirement 'as good as it gets'". ESPN. Retrieved May 31, 2016. ^ Ryan, Chris. "Devils to dedicate Martin Brodeur statue on Oct. 22". NJ.com. Retrieved October 20, 2016. ^ "Devils name Martin Brodeur Executive VP of Business Development". NHL.com. August 29, 2018. Retrieved August 30, 2018. ^ a b "Backup battle heats up at Canada camp". TSN.ca. Canadian Press. August 18, 2005. Archived from the original on June 4, 2011. Retrieved February 27, 2007. ^ a b LeBrun, Pierre (February 22, 2010). "It's time Canada made a change in net". ESPN. Retrieved November 14, 2016. ^ Rosen, Dan (February 6, 2016). "Olympic gold medal put Broduer 'on a pedestal'". National Hockey League. Retrieved November 14, 2016. ^ a b c d e f Kubatko, Justin. "Martin Brodeur". Olympics at Sports-Reference.com. Sports Reference LLC. Retrieved November 14, 2016. ^ a b Hradek, E. J. (September 14, 2004). "Brodeur better than lucky". ESPN. Retrieved November 14, 2016. ^ Brodeur and Cox, p. 116. ^ "Olympic Men's Hockey: 2010 Vancouver Summary". Hockey Hall of Fame. Retrieved November 14, 2016. ^ a b c "Present Olympic Athletes >> Martin Brodeur". ESPN. Retrieved November 14, 2016. ^ "Brodeur's wife files for divorce". ESPN.com. May 21, 2003. Archived from the original on May 19, 2006. Retrieved April 12, 2007. ^ "Canada's capital primed for East finals". sportingnews.com. 2003. Archived from the original on October 14, 2008. Retrieved April 15, 2007. ^ Puck Daddy (June 30, 2008). "Romantic or insane: Marty Brodeur gets married again". Yahoo! Sports. Retrieved June 30, 2008. ^ Gulitti, Tom (November 24, 2009). "Brodeur a happy father—again; Eckford and Corrente switch spots". The Bergen Record. Archived from the original on November 28, 2009. Retrieved November 24, 2009. ^ "Brodeur: Beyond the Crease (Hardcover)". Amazon.com. 2006. Retrieved December 6, 2006. ^ "About Martin – La Pizzeria Etc". MartinBrodeur30.com. 2009. Archived from the original on March 4, 2009. Retrieved February 26, 2009. ^ Ross, Sherry (January 3, 1999). "The Devil's Little Angels Puck Stops Here For Brodeur Clan". New York Daily News. Retrieved October 21, 2016. ^ "Martin Brodeur's son Anthony joins Penticton Vees | Penticton Western News". pentictonwesternnews.com. August 5, 2015. Retrieved November 13, 2015. ^ "Devils' Brodeur earns EA NHL 14 cover honor". National Hockey League. June 29, 2013. Retrieved December 8, 2016. ^ "NHL & WHA Career Leaders and Records for Wins". Hockey-Reference. Retrieved November 16, 2016. ^ "NHL & WHA Career Leaders and Records for Shutouts". Hockey-Reference. Retrieved November 16, 2016. ^ "NHL & WHA Career Leaders and Records for Games Played". Hockey-Reference. Retrieved November 16, 2016. ^ Paine, Neil (January 28, 2015). "Martin Brodeur's Legacy, By The Numbers". FiveThirtyEight. Retrieved November 16, 2016. ^ a b Gulitti, Tom (January 27, 2015). "Martin Brodeur's legacy will be as a Devil and one of NHL's best ever: No. 30 sure to be retired". The Record. Retrieved November 16, 2016. ^ "William M. Jennings Trophy". National Hockey League. Retrieved December 8, 2016. ^ Morreale, Mike G. (February 7, 2016). "Brodeur's son celebrates Dad's legacy in game". National Hockey League. Retrieved November 16, 2016. ^ a b Politi, Steve (January 28, 2015). "There's no debate: Ex-Devil Martin Brodeur retires as the NHL's greatest goalie ever". The Star-Ledger. Retrieved November 16, 2016. ^ Boyle, Chris (October 24, 2014). "Stats say the greatest NHL goalie is ... ?". Sportsnet. Retrieved November 16, 2016. ^ Strang, Katie (January 27, 2015). "Brodeur's legacy remains intact". ESPN. Retrieved November 16, 2016. ^ Rosen, Dan (June 26, 2018). "Brodeur, O'Ree, Bettman lead Hockey Hall of Fame Class of 2018". NHL.com. Retrieved June 26, 2018. ^ The 2007 ESPN Sports Almanac. ESPN Books. 2008. p. 528. ISBN 1-933060-38-7. Wikimedia Commons has media related to Martin Brodeur.